So you’re guilty of killing some house plants. We recently visited a crew of world-class gardeners in Farmland, Midwest (Naperville, Illinois) to get the scoop (or spade, as it were) on turning your house into a fine home, but with plants. Why do you need plants? Because they look good, clean the air, catch flies, calm your mind … and they’re quite possibly the literal design materials of the future. From the cardinal rule of watering to a selection of vital, vibrant, low-maintenance plants that can ship to your door today, your marching orders await below. Earlier this month I spent a morning with the experts at Ball Horticultural Company, where every stage in the cycle of seed-start-plant is represented. It was a masterclass in home horticulture. The nine-acre property showcases the best and brightest of hybrids, mainstays and newbie plants and flowers in different landscaping styles that reveal the park along its curves and paths (they call one research area “a Willy Wonka seed lab,” which is remarkably accurate). I asked Tim Duffin and Katie Rotella of Ball Horticultural Company about the basics of nurturing plants at home, from what they say to those fearful of playing God to how to be attentive but not a helicopter parent. A possibly contentious take I’ve seen espoused by the caretakers behind Houseplant Journal: keep them in the plastic pots, even when upsizing, so you can swap between decorative pots at will. This also minimizes the possibility of poor watering. Do a scan of your greens on the regular. It’ll help you spot any abnormalities like leaf loss, problem areas for pests or discoloration. This is also when you’ll experience the unmitigated delight of discovering new flowers, leaves or even entirely new buds springing up from the soil. Note: be careful about bringing outdoor plants indoors, whether in an attempt to prolong its flowering cycle or just to mix it up. You can easily transfer pests and infestation problems to your inside ecosystem. A thorough wipedown of the inside of the pot before bringing them inside with a solution of super-diluted bleach will help. How is being around plants good for us? Turns out, in a whole slew of ways. Their mere presence is calming, and evidence suggests time in nature helps our physical and mental health in all kinds of ways. Consider Silicon Valley, where they’re deep in their embrace of the movement to bring plants indoors: Amazon’s Seattle office has more than 40,000 plants, while Microsoft has treehouse-like meeting spaces. There’s also a growing community of researchers wondering how we can use plants, as Fast Company dubbed it, to be “home health detectors” — as indicators of air quality, plants can monitor for substances like mold and volatile organic compounds (VOCs). Think of them like you would a Nest cam … except they don’t require batteries and boast a longer track record (~470 million years and running). Elsewhere, in the world of architecture, proposals for “biophilic” and “bioclimatic” designs are appearing left and right. Buildings with greenroofs and greenwalls are cutting edge but also have historical precedents: humans have used plant matter as building materials for a very, very long time. And when it comes to home decor and the styling of basically any space, plants are undeniably “on trend.” If after reading this you become addicted and want to buy 700 succulents tomorrow, you’ll probably get a magazine article written about you. While you can and eventually may start some plants from seed, it’s not a must. Buying “starts” and even fully mature plants is an easy way to build your collection. So until your find your favorite hometown garden center, you can get everything you need, plants on Amazon (even a straight-up houseplant kit, but don’t do that). Below, a curation of good-looking, easy-to-care-for plants to get your collection rooted, organized by type: succulent, vining, flowering and more. Famously easy to care for, drought tolerant, and often a cinch to propagate (make more of), so you can send your friends home with little starters. Can be grown indoors or outdoors if proper conditions are met. There is a whole category of plants that get basically everything they need from the air and require little attention aside from an occasional spritzing. Some will bloom, some will create little pups (what their plantlets are called) and some will change colors. Start mixing up your countertop collection with trees and larger plants that can become focal points in a room. Some will be more adaptable than others, but continue to mind the basics when making adjustments to light, orientation and watering. Want instant elegance? 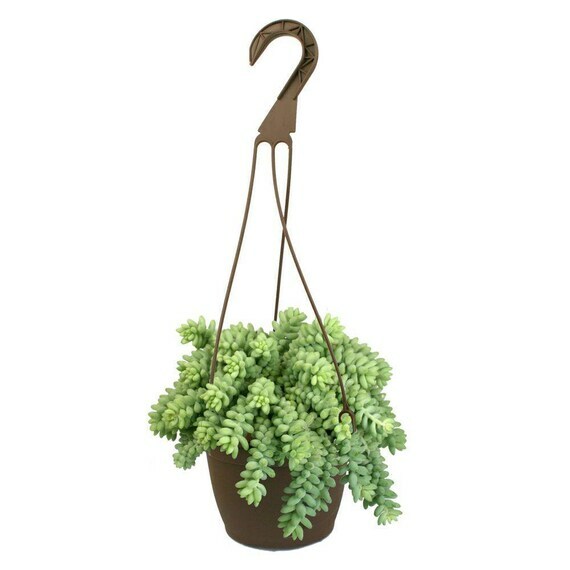 Get a hanging plant. Pothos can start from a single leaf and stem then vine and bush out to an unwieldy degree, which makes it popular among people with gardens of all sizes. Spider plants clean the air. Pitcher plants will catch and “eat” flies. If you want more than just infinity shades of green in your home, you can still find plenty of plants that’ll flower indoors, seasons and conditions permitting. Do be aware of the dangers to pets’ and kids’ health, with flowering plants and others. Can you just pour a bag of dirt in the pot and call it good? Kind of. Over time, your soil becomes depleted, so it’s good to fertilize once a year or so. You can also aerate compacted soil with chopsticks or another stick-y object if you notice your water is draining very slowly. Just gently poke down when the soil is on the dryer side, minding roots as possible, and wiggle. Do this in a few areas. If, after all your diligence, you can’t manage to keep your pals healthy, there’s always next season. Just continue to mind your plants and the amount of sun, water and nutrition they get. With patience and real attention, you’ll soon have a luscious garden to rival Tulum.